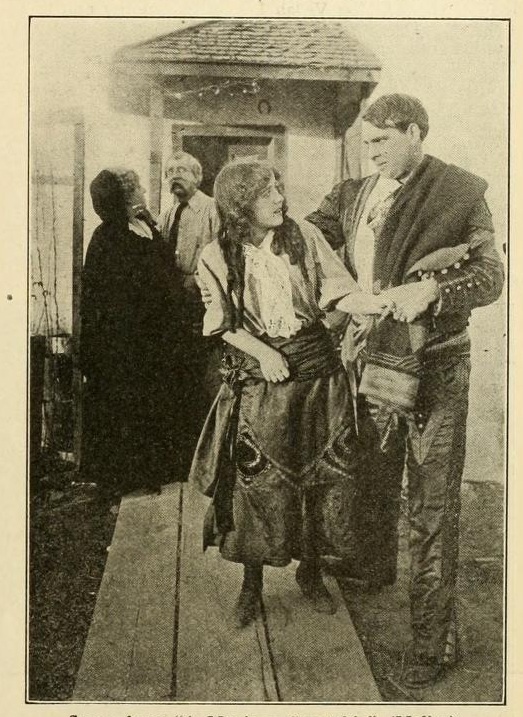 The Moving Picture World (Volume XI) Jan-Mar 1912. pp. 710. Alonzo is a much more desirable match and that she must give up poor Juan. This Dolores reluctantly agrees to do. Finally the eventful day arrives. Alonzo, however, reaches the Plaza far too drunk to enter the arena and the management is in despair. The time for the fight to start having passed, the crowd begins to hoot and howl. The manager is at his wits’ end. Young Juan volunteers to take Alonzo’s place and kill the bull. The manager laughs at him but finally with no other alternative and impressed by the lad’s earnestness, he consents and Juan, garbed in all the regalia as a matador, enters the ring. He kills the bull and at one bound secures fame and riches. The parents of Dolores are quick to realize that the famous matador is a very different proposition form the poverty-stricken hanger-on of the Plaza and the newly created bullfighter is happy in his victory and his love. For some time Director Wilbert Melville and a company of Lubin players have been working in the vicinity of El Paso, Texas, and have been sending back some very interesting Mexican subjects. One of the most recent to come to our attention is a dramatic production entitled “A Mexican Courtship,” which is set in and about the Mexican city, Juarez, on the banks of the Rio Grande. The picture opens with all the excitement attending a bull fight. Alonzo, the famous bullfighter, is to match his skill against the brave bull from Chihuahua, and the game is looked forward to with great interest by the entire population. Pretty little Dolores Duanes shares the general interest and one day wanders without the Plaza El Torres hoping to get one peep at the wonderful animals. Juan Gracio [sic], a young Mexican employed at the bull ring, sees the girl and, attracted by her beauty, offers to show her the bulls, an offer which she gladly accepts. He takes her within the Plaza and shows her all of the interesting sights. The young people are mutually interested in each other. They meet often and in a few days are firmly in love. As usual, however, the course of true love does not run smooth. A few days before the fight, Alonzo, the matador meets Dolores and is equally smitten. He forces himself upon her and proposes for her hand. Dolores is not impressed with him, but the bullfighter is insistent and seeks the influence of the girl’s parents, who, realizing that he is a rich and famous man, favor his suit. With his great reputation and ability to make money, he certainly presents a better match than the poor odd-jobs man of the arena. Finally the eventful day arrives – the entire town turn out to see their favorite triumph over El Toro. The arena is crowded, but there is a delay; something seems to be wrong. The matador is late. Finally Alonzo reaches the Plaza and is in such a state of intoxication that with all effort it is impossible for him to enter the ring. The crowd is impatient and yelling for the fight to commence; the directors are frantic; there is no man among the toreadors who would dare to face the Chihuahua monster. In the midst of the crisis Juan dashes into the directors’ room. He pushes the toreadors aside and declares himself willing to meet the bull. The directors look upon the proposition as absurd. The professional bullfighters, who have not the courage to take Alonzo’s place, laugh at Juan. “He a matador? Why, the bull would gore him to death.” Juan pleads with the directors, who, hearing the clamor of the people, finally agree, fully satisfied that the bull will win and praying for the life of the reckless boy. Juan dons the uniform and in all the splendor of satin and gold salutes the crowd. They all see that it is not the famous Alonzo and hearts palpitate for the fate of the daring amateur. The gates are opened and the bull gallops in. Picadors and bandarillos [sic] tantalize the beast to fury. Juan calmly looks on for a while, then he takes the center of the ring. He shakes his crimson scarf at the animal, which immediately gives chase. Being pressed hard, Juan leaps from right to left in front of the infuriated beast. Presently he faces the animal and, with a well-aimed blow, his rapier is buried in the bull’s shoulder. Two or three spasms and he is dead. Juan salutes the crowd, who yell and applaud frantically. Dolores and her parents are there. Throughout the scene she has covered her eyes with fear. Now she springs into his arms, and her parents are only too proud to bestow her hand on the daring boy who in short order will be hailed the greatest matador of Mexico. A MEXICAN COURTSHIP, (Lubin). March 2. — This is one of the very best melodramatic pictures that the Lubin Company has put out in many a week, one of the best that has been released by any company. It is a bull fight, love story, with an excellent and very exciting picture of the fight and the death of a vicious bull. The story, although in outline it is what might be called a classic convention in Spanish literature, is absolutely fresh, so far as we know, in pictures and is eminently worthwhile. It is in fact, a picture among good pictures for the exhibitor, one to excite enthusiasm. During the bull fight in which the lowly hero killed the bull and won the girl, the camera seems to have stood in the very arena. At one instant the thoroughly mad bull was coming right toward us, and that particular view was cut very short. Perhaps the camera man got away quick. Perhaps I was the bull who got the camera. He certainly looked as though he was just on the point of his horn of getting something. It is a rattling good picture. We are glad that we saw it and we believe others will be glad I see it. The audience that saw it with us seemed to be. The photographs are good. 1206 / 23. A Mexican Courtship. Producción: EU (Lubin), 1912. Dirección: Wilbert Melville. Intérpretes: Edna Payne, Burton King, Romaine Fielding. 1 rollo. De las pocas películas que no denigran al mexicano o lo estereotipan como flojo y borracho. En el caso de esta película, el alcohólismo del torero no es manejado como característica racial o cultural. A continuación un par de pasajes de dos biografías sobre Siegmund Lubin donde coinciden ambos autores en que el equipo filmó al menos dos cintas en El Paso; una de ellas A Mexican Courship. In 1912 [Lubin] sent a troupe to Arizona. The Lubin group arrived in Douglas, Arizona on February 22, 1912, after taking the El Paso and Southwestern Railroad from El Paso, Texas, where they’d been making films along the Texas border and in Juarez since December, 1911. Their intention was to make similar films in the Douglas area, particularly in Douglas’s sister city, Agua Prieta, Mexico, which was – both literally and figuratively – little more than stone’s throw from the center of Douglas proper. The company’s El Paso work included The Handicap, A Mexican Courtship, and probably at least the first reel of The Revolution. During its stay in El Paso, the Lubins seem to have specialized in films about Mexican revolutionaries. Mexican treachery and the like, capitalizing on the topicality of Mexico’s political unrest, and they surely intended to continue this when they arrived in Arizona. But they may have thought twice once they got there. Things along the Arizona-Mexican border were turning ugly. In El Paso, the Lubins had never far from the 18th Infantry stationed at Fort Bliss. In Douglas, they were on their own. When Wilbert Melville left Philadelphia in Junuary 1912 with his stock company, he was headed for El Paso on the Texas/Mexico border. With revolution raging in Mexico since 1910, public interest in the conflict was high, and Lubin hoped to cash on it. El Paso was as close as a film crew could get to the Mexican conflict without crossing the border and offered the possibility of actually filming in Mexico as the situation there permitted. Only eight months before in May 1911, Mexican revolutionaries had attacked and captured the town of Ciudad Juarez just across the Rio Grande, an event witnessed by the whole population of El Paso, which climbed to the rooftops to watch and cheer. Intent on using the local scenery, Hispanic extras, and frequent border disturbances as the ingredients for a series of films based on Mexican themes, Melville devoted himself to his task with remarkable single-mindedness, showing little or no sensitivity to the dangers and tensions produced by the war. One of his cameramen was nearly killed when he sent the man into Mexico to film the parade of a nearby Federal Mexican regiment. Having never seen a movie camera before, the several hundred soldiers mistook the cameraman for an Insurrecto with a machine gun and arrested him. In El Paso Melville obtained permission from the local chief of police “to use the highways…and a number of peace abiding citizens” for a scene, then proceeded to stage a stunningly realistic battle with four hundred extras dressed up as Federales and Insurrectos. The mayor of El Paso was horrified. Fearing the Mexican forces across the narrow river would mistake the scene for the real thing and attack El Paso, he ordered the arrest of everyone involved and quickly sent word over to Juarez that there was no cause for alarm. Seeing his troops routed by the police, Melville beat a retreat in his automobile, becoming the only member of the Southwest Company not incarcerated. It cost ten dollars a head to bail out everyone. Melville could count himself lucky that it was Lowry to whom this fiasco had to be reported and not Lubin. Shortly thereafter, having produced only two films in El Paso, Melville moved on to Tucson where he established a semi-permanent studio with an outdoor stage at 315 North Stone Avenue. Consistent with the approach of most other contemporary American directors making films with Mexican themes, Melville portrayed his Mexican characters in the negative stereotypical terms the average American audience was likely to expect. Mexican men in particular were shown as sneaky, sleazy, cowardly, and vengeful.